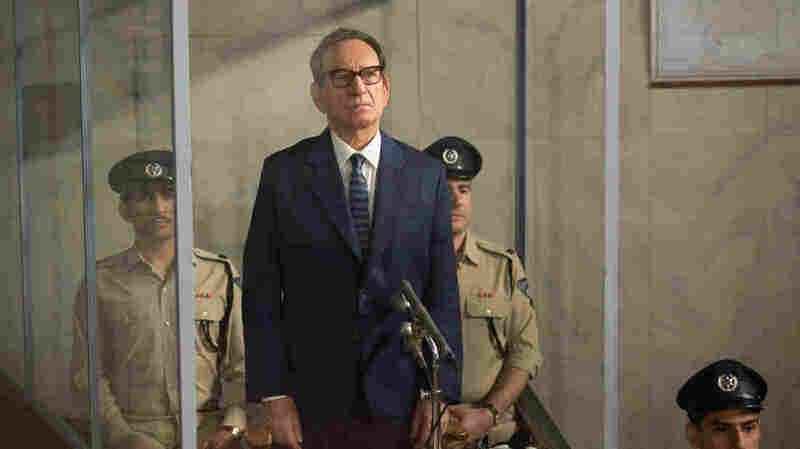 To Catch A Nazi: 'Operation Finale' Is More A Talker Than A Thriller Director Chris Weitz seems ill-at-ease with the rhythms of action scenes, but this Hollywood-zed version of history comes to life when it features Oscar Isaac and Ben Kingsley verbally sparring. Adolf Eichmann (Ben Kingsley) models the banality of evil in the historical drama Operation Finale. For a drama about the capture of one of the most notorious architects of the Holocaust, Chris Weitz's Operation Finale begins with a bit of a caper. A crack team of Mossad agents, on a tip from a young Jewish woman (Haley Lu Richardson), bungle the job by bringing down the wrong Nazi. Shrugging off their error, the unit, headed by Peter Malkin (Oscar Isaac) forges ahead to snag the real Adolf Eichmann as he's walking home through a leafy Buenos Aires suburb. Needless to say, he's played by Ben Kingsley; so also needless to say, he is seriously unflapped. 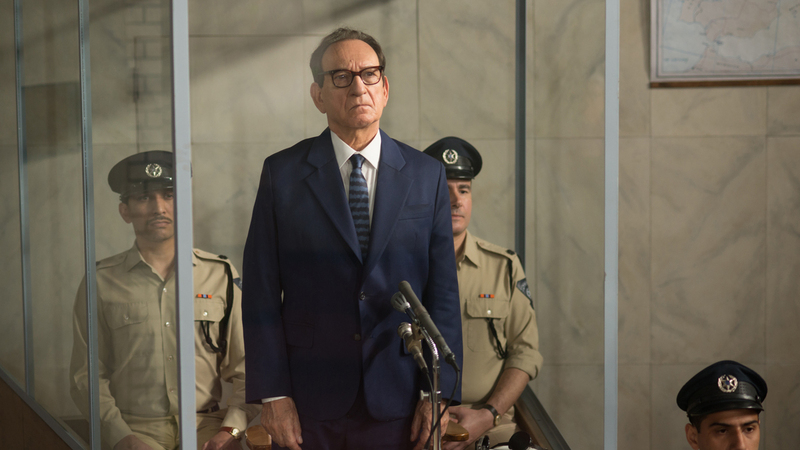 Though it's framed as a thriller, Operation Finale isn't much of an action picture. Not that it needs to be: That ground has already been covered by at least three television movies about Eichmann's brazen 1960 abduction from under the noses of an Argentine police force heavily indebted to a flourishing local community of German fascist ex-pats. And though Weitz has worked comfortably with and without his brother Paul in a bunch of genres (American Pie, a Twilight movie, and the wonderful dramedy About a Boy), here the director seems ill-at-ease with the tight structure and staccato rhythms of the thriller. The action scenes are slackly paced and weighed down by an abundance of glibly realized secondary characters standing in for old and new generations in a fledgling State of Israel. Lior Raz, from the Netflix series Fauda, is manlier than thou as Isser Harel, the real-life Mossad director who planned the capture. Melanie Laurent is wasted as an Israeli doctor whose chief function is to stick needles in the prisoner while making goo-goo eyes at Malkin (her ex, but they're split). And British actor Simon Russell Beale, so marvelous as Beria in the recent The Death of Stalin, pops in with a fuzz of important hair as Israeli Prime Minister David Ben Gurion to underline the historical import of catching Eichmann. But it's Isaac's Malkin, loosely based on a real-life team leader, who personifies an Israel still raw fifteen years after the trauma of the Holocaust. The movie is littered with flashbacks imagining possible deaths for Malkin's sister, about whom all he knows is that she perished in a forest with her children, conceivably on Eichmann's orders. Claude Lanzmann, whose magisterial documentary Shoah is the nearest thing we have to a definitive account of the Holocaust, would likely have hated the reductive Hollywood shorthand in which avenging his sister's death is Malkin's reason for bringing Eichmann to trial. Yet it's in the movie's lengthy middle sequence of verbal sparring between Malkin and Eichmann that Operation Finale comes into its own. During a ten-day flight delay, Malkin must coerce or persuade Eichmann to sign off on his willingness to be transported to Israel to face what he regards as a show trial. Kingsley has spent most of his career honing a variety of sphinxes, and here he shifts the mask around adroitly as Eichmann, after insisting that he's just a prosperous businessman named Ricardo Klement, switches gears to advance the infamously slippery claim that he was not a monster but merely a cog in the Final Solution machine, "chained to my desk twenty hours a day." That won't wash with Malkin, no mean dissembler himself. Their quietly lethal war of words (Matthew Orton's screenplay comes to vivid life here), bolstered by flashbacks of Eichmann's active participation in the execution of his orders, foreshadows the real-life trial we glimpse only with the end credits, where the notion that Eichmann was merely a bureaucrat following orders was forcefully demolished. To its credit, Operation Finale also offers a rebuke to the sentimental but commonly held notion that the Nazis were an inhuman aberration. In the sheer range of his capacities, from worrying about the safety of his family to presiding over a blueprint for the obliteration of an entire people, Kingsley's Eichmann shows himself all too human, a monster among other genocidal monsters who came before and after him. One only wishes that the movie had not undermined this painful truth by resorting to the vulgar bromide that, having dispatched one source of the trauma inflicted on the Jewish people, its victims experienced closure.